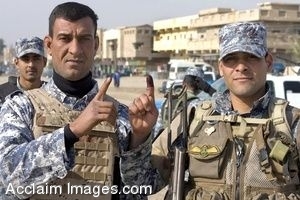 Description: Clipart photograph of Iraqi soldiers at a polling site in Baghdad. The soldiers are showing the ink on their hands. Clipart photograph by Department of Defense Public Domain.